Firefighters late Monday were working to contain a vegetation fire on the western edge of Saratoga, Santa Clara County Fire Department officials said, but they were delayed when a drone got in the way. The fire was reported on Mt. Eden Road west of Pierce Road, according to an alert sent out by fire officials at 3:51 p.m. By about 11 p.m., fire crews said the blaze had burned 10 acres and was 40 percent contained. A previous 75 percent containment number reported by fire officials was determined to be incorrect. Officials conformed that a drone was spotted flying over the area where the firefight was taking place. That presented a major problem. 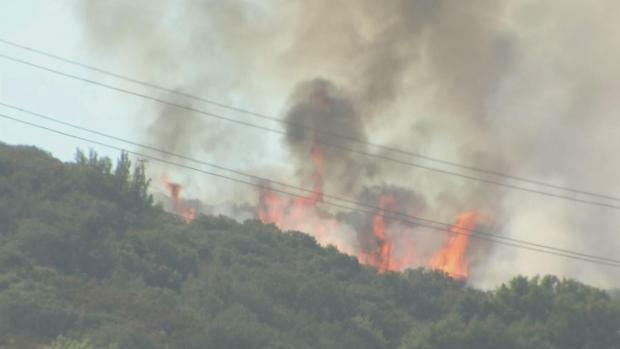 A brush fire burned near the Mountain Winery in Saratoga late Monday afternoon. Marianne Favro reports. Flying drones in an emergency zone is a violation of FAA rules and California codes. "It probably didn’t affect this fire that much, but if it would have impacted that helicopter, it could have caused it to crash," Cronin said. The fire burned uphill and away from homes, official said. No structures were threatened, and no evacuations were ordered. Initially it was reported that officials had asked residents in the Mt. Eden Road area to shelter in place so emergency heavy equipment can access the fire. But Cronin later said the road was open to residents and some through traffic. The slow-moving fire worried some of the people living in the area. "I loaded up the car with important paperwork, computer, family photos, just in case," resident Nicole Golko said. Jan Garrod is the general manager of Cooper/Garrod Vineyards. A day camp for children was in session at the vineyard, putting parents on alert. "It’s like school; parents were coming to pick up kids, and they shut the door," Garrod said. "They all had to stay here."